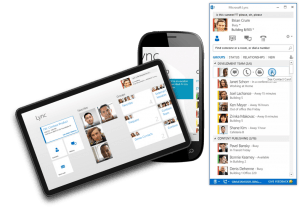 Microsoft Skype for Business is a communications solution that allows your employees to communicate with colleagues and customers in a variety of ways. Skype for Business provides a single client experience on all devices, whether mobile, tablet, laptop or PC, that can be used to communicate using Instant Messaging (IM), voice and video conferencing, group presentation, and desktop sharing with hundreds of millions of people around the world who use Skype. Skype for Business is available as a standalone hosted service from Microsoft, or as part of an Office 365 subscription with little to no ongoing maintenance costs and flexible per user pricing. The Skype for Business software is hosted in Microsoft data centres which are accessible to all users within the company network and over the internet, making Skype for Business an excellent choice for collaborating with field/home based users and consultants.